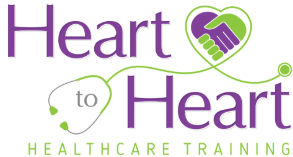 Heart to Heart Healthcare Training offers 2-week certified nurse assistant (CNA) classes at both of our locations – Essexville and Ypsilanti. We are approved through the state of Michigan and are licensed as a proprietary school. We run a 2-week CNA class every month at each location. We have posted the schedules at the bottom of this post. Our 2-week CNA class runs Monday through Friday from 9am to 5pm. Our certified nurse assistant class consists of lecture, lab and clinical. The lecture portion of the class includes PowerPoint presentations as well as small group exercises with students. At Heart to Heart we prioritize the hands-on approach to learning. We accomplish this by having our students practice all of the skills they will be responsible for as a CNA throughout the class time. This repetition allows the student to become comfortable and confident in their skills, which results in a smooth transition to the clinical setting. 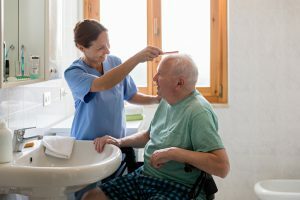 In the clinical setting the student will be taking care of resident’s in a local nursing home under the supervision of the Instructor who is a registered nurse. At the end of our 2-week CNA class our students feel comfortable, confident and ready to embark on their new career as a certified nurse assistant. At Heart to Heart we pride ourselves in graduating students who give the highest quality care to our community’s loved one’s. Our standard of care for our students is that they care for each individual patient as if it is their own loved one, they are caring for. You can find Heart to Heart students who have graduated from our 2-week CNA class throughout the community caring for patients. The total cost of the class for the Certified Nurse Assistant class is $925 and includes the textbook, and all needed supplies for the class except for a pair of purple scrubs. We require a $300 deposit for the class to secure your spot, the remaining $625 is due on or before the first day of class. Our requirements for the 2-week CNA classes are you must be at least 17 years-old, pass a background test and have a negative TB test within the last year. We always recommend that you register as soon as possible as we can only take a certain number of students for each class. There are several ways to register for our two-week CNA class. To register for the class, you can go to our website – Apply Now. You can also make your deposit over the phone by calling 800-970-2918. Lastly you can request a registration packet and send a check in the mail with the completed paperwork, or by making an appointment to meet at the school to register.